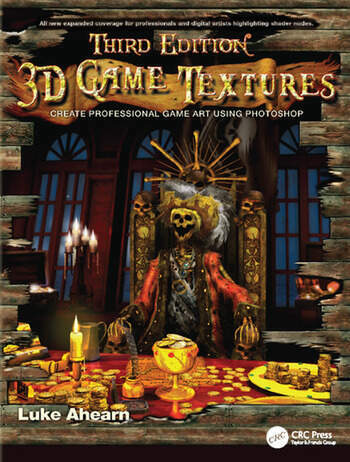 A broadly enhanced new edition of Luke Ahearn's cornerstone game art book "3D Game Textures" is here. When digital art software was in its infancy, most digital art, especially vector art, was textureless. With the advance in software, it is now possible to incorporate texture into most types of digital art. However, if the artists cannot build their own textures, they are limited to using commercial textures. In this enhanced 3rd edition of Luke Ahearn's gem of a book, not only does Luke teach you how to create your own unique textures, he also teaches how to create shaders (the visual effects - reflections, refractions, opacity - that make textures come to life) and materials (collections of shaders that fill well together to map to a particular scene or environment). You can now expand your skill set immeasurably, and create more compelling, varied art work from scratch.Unlike anything on the market, this book provides an in-depth guide to game textures, shaders and materials- with hundreds of high-quality examples. The companion website includes: demo versions of relevant software; resource images; all images from the book.